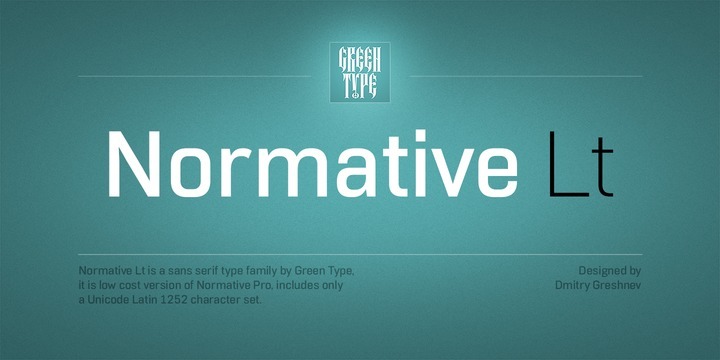 Normative Lt is a sans serif typeface created by Dmitry Greshnev and published by Green Type which is available in 12 styles, 6 weights (from Thin to Black) with accompanying italics, useful OpenType features, a Unicode Latin 1252 character set and language support. This low cost version of Normative Pro, it was designed to be suitable for a lots of applications, magazine, poster, packaging, but also in branding and advertising. It is merge in both small & large sizes. Enjoy! Price: starting from $19,00 for one font to $180,00 for all 12 fonts. A font description published on Friday, October 20th, 2017 in Dmitry Greshnev, Fonts, Green Type by Alexandra that has 2,120 views.